In today’s fast-paced society trends change on a day-to-day basis and prices often go on a wicked roller coaster ride. Naturally, it is no surprise that saving coupons and scouring the Internet for great deals have become a commonplace practice. No wonder that website like Get It Free has greatly risen in popularity. So therefore, what about Get It Free – Is it a scam or legit? Let’s zoom out and see if it can give you a little more fun – and save you a lot more money. My Verdict: Get It Free is not a downright scam. This being said, because there are tons of complaints from customers (like how they complete survey after survey, yet receive no gifts or anything), therefore I find it difficult to recommend it. 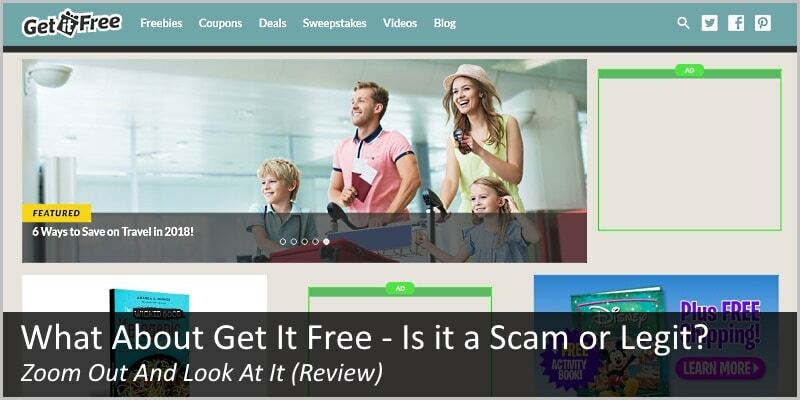 Full Review: What About Get It Free – Is It a Scam? Get It Free is a website that promotes the value of saving money through online deals and printable coupons for just about anything. They say that the site can provide a great number of ways in which users can save money through their partnership with different merchants. These coupons and deals can apply to items purchased from name-brand groceries and everyday items from the market. They are also said to provide discounts on luxury items and wholesale purchases. Their homepage is chock full of freebies, deals, and sweepstakes, as well as travel deals and coupons. You can sign up for the daily newsletter using your email, and they will send you an update that they may have. Be careful as this would mean that you will get emails on a daily basis and their emails might end up inside your junk folder. How Does Get It Free Work? Before you go ahead and ask; “is Get It Free a scam?” The people behind Get It Free scour the Internet for deals and other promotions, and then place them on single site then ordered by category. They are displayed in a grid layout of large squares that would have graphics that are sourced directly from the site in which they were found. These tiles are clickable and clicking on one would direct you to the page where there is more information about the item you are purchasing. The instructions are clear, and transactions are usually a fast process until the redemption. Usually, once you redeem a freebie, you will be lead directly to the third party site from which the offer is being hosted. This means that you would have to follow their instructions again and fill out the needed forms before pressing submit. As named, freebies are giveaways that can be taken advantage of, usually by accomplishing one or more tasks requested by the third-party host or the company that originated the freebie. Most of the time, the tasks would require you to like social media pages and then share to your page – so that they can get organic followers in exchange for the freebie. 2. Coupons – these are just like your run of the mill coupons that you get through the mail or the supermarket checkout line. They often provide discounted rates for certain items; sometimes they would have a required purchase, but most of the time there’s none. 3. Online coupons can be used the same way as printed coupons. However, the difference is that Get It Free leads you to sites that offer said coupons. They, of course, would almost always have different ways of availing it. There might be a required purchase, or you may be required to sign up. 4. Deals – these often buy one get one promotion or coupons for items that are discounted at a certain rate. Most of the time deals would include services instead of products, like massage treatment and valet services. 5. Sweepstakes – just like traditional sweepstakes, online sweepstakes provide you an opportunity to win not just money but other prizes like vehicles and appliances as well. What Get It Free does is that it links their site with several sweepstakes raffle around your area. And it lets you access those using your information. 6. Blog – these don’t save money but these articles (or blog posts as they are most popularly called) often revolve around ways to get more out of your deals or coupons. Using Get It Free is free, and all you need is an email address so that you can have access to the newsletter and other information that they send customers on a regular basis. Using this site has its own set of advantage and disadvantages though. Convenient – having all these options to save money in one location is pretty convenient. Also, its categorization is simple and easy to navigate in. There’s no more need to search for this and search for that, browse this and browse that. All the selections that you can think of at a lower price (sometimes for free) are accessible through the Get It Free site. The concept behind the site is to provide you backlinks to the third party that hosts the freebie or coupon. That being said, Get It Free does not have any control when it comes to the freebies and deals that online consumers signed up for. Most of these consumers fear that being a third party entity lessens the accountability of the site which makes it appear that it does not care much for its user. As previously stated, Get If Free has no control over what happens whenever customers are lead back to the third party site. Anything that was done then and there would be confidential between the buyer and the third party host. This is why they sometimes could not react or reply easily problematic purchases. The unsubscribe link and the codes provided do not often work. Especially if you are receiving harassing phone calls and texts about the items you did not want or could no longer avail. It is as clear as a clear sky, isn’t it? So therefore, you can expect annoying emails and phone calls from businesses you never heard about. See! Both customers have spent a noticable amount of time to “earn” their “free” stuff, yet have got nothing. Disgusting behavior by Get It Free, do you agree? Get It Free is just a place to access deals and promotions and does not offer them directly. They are the launching pad for the sites that do. This means that any transaction between the buyer and the third-party host is exclusive between the two of them. Get It Free only acts as a channel for the two parties to interact and close deals. These do not mean, though, that Get It Free is not liable for anything. Anything that they post on their website should be from legal and reputable sources so that their customers would not feel cheated if in case a deal does not go as planned. There are other websites out there aside from Get It Free. For example, BzzAgent, FreeFlys, WomenFreebies, Toluna, to name but a few. With similar or better function, you should always take note that these sites offer these services for free, but they cannot control whatever occurs between you and the site you purchased an item from. Make a point to always read the fine print to avoid being scammed or tricked into an arrangement that you do not like. Final Verdict: Is Get It Free a Scam? Going back to the question if the whole site and it shenanigans are a scam… Well, it’s a bit difficult to answer. When so many people get deceived and scammed, wouldn’t you call it a scam? To make it clear, Get It Free is *not* an outright scam like SnapCash Binary scam, Lisa Westbrook work-at-home scam, or Richard Branson Binary Options scam. However, when you see how badly they treat their (often exceptionally loyal) customers, well… You can say that Get It Free is a scam, right? Yes, the raw, sizzling beauty of passive income stream online. So click here now. Sometimes ‘later’ becomes ‘never‘. Thank you for taking time and reading my Get it Free review. What do you think, is Get It Free a scam or legit? Do you have any personal experience with the platform (good or bad) that you want to share? Please leave me a comment into the comment section below. I’ve gotten a bath and body works small votive candle, a $5 subway card, a small craftsman screwdriver,a Victoria secret face mask, a dewalt drill bit, 2 mac makeup eyeshadows, and a few other things from get it free. There is a way to get around it all and get to a page where they send you a confirmation email. I’ve gotten pretty much everything I’ve signed up for and when I didnt receive one item I messaged them and I got the item sent right out. I like them I get 1 free thing every 30 days. Like I said there is a method to it but once I figured it out I’m not disappointed at all. It’s encouraging to hear that you have found a way to get maximum out of Get It Free; and that now you like the platform. Was it difficult to figure it out? And you don’t want to share it with others, do you? How can you stop the “Get it Free” popups? Hey, Carl, and thank you for the feedback. There are different ways to block pop-ups. I don’t know which ones you have already tried (and which browser you use) but I know there are specific browser extensions that block all kind of pop-ups. Have you tried these already? Also, there are ways to remove adware and malware pop-up ads from your system. I recommend you Google “How to block Get it free pop ups”. There are a number of articles that can point you in a direction you find helpful. How do you stop getting the pop-ups and unsubscribe? The message I got was that I would receive Victoria’s Secret’s complementary 2019 samples and all I got was filling out surveys on free stuff. That’s not what I signed up for! this is not legitimate! I Call it a scam!! They’re trying to pull the wool over my eyes so to speak! Hey, Linda, and thank you for your feedback. Sad to hear about your negative experience with the Get it Free platform. And, it’s sad to see how businesses destroy their reputation by systematically deceiving their (often loyal and long term) customers. Can’t they keep their promises? I fact, if you look around, you can see such deceitful behavior almost everywhere. Promises filled with nothing but hot air are so common in business that it’s just disgusting. 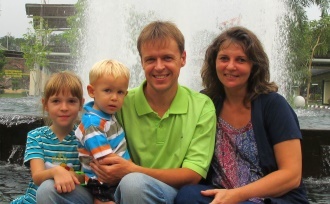 Thank you again, Linda, for sharing your experience with Get It Free. One of the biggest scams out there. Despite repeated assurances that I have more than sufficient life insurance they continued to push for my purchase for more. I have never received a thing from these type of sites. Thank you for the feedback, Debra. They way they treat their customers, is really ugly, isn’t it? Why behave like that? Why “torture” your (often loyal) customers with hard selling as you described? Why deceive your customers? Disgusting. That being said, I am very thankful that you took time to share your experience with the readers here. I filled out the survey as requested and opt out of getting information from other companies. They keep calling me and trying to sell me. The only thing I got from Get It Free was a Dewalt drill holder. Nice tool but not what I was told would get. Your company it a fault advertisement. I will never join in on another survey for free items, there is no such thing. Thank you for the comment, William. Ridiculous, isn’t it? You get a drill holder and tons of calls, annoyance, and headache as a bonus. True, the whole thing is not worth it. Thank you for sharing your experience with other readers. OMG yes they are such a scam because I have been taking survey after survey after survey. When I first saw their advertisement on Instagram I was like “Oh I could get some free stuff” but NOPE – I GOT NOTHING BESIDES SURVEYS! So please don’t sign up to get there “free stuff”. They will keep calling and calling you from different phone numbers and harass you. Hey, Lydia, and thank you for your comment and feedback. I appreciate it a lot. And I am very sorry for my so late reply – I had a really long vacation this year (summer) and that’s why I was so long away from computer. Thank you again for your feedback. I see the trend here. I hear more and more people complaining that instead of promised free stuff all they get are annoying and never ending calls from the “Get It Free”. Terrible and disgusting, to say the least. The good thing here is that other readers are warned and better prepared for what to expect from that “Get Free stuff” website. Thank you again for warning!